Who doesn't love a list? Simple, concise, efficient, lists are a great way to put all the important information in a single place for quick reference and to help us avoid distraction. They help us remember (think grocery and laundry lists), keep us organized (a to-do list at our sides at work ensures nothing slips between the cracks), and give us direction (those same lists help us know how and what to prioritize). 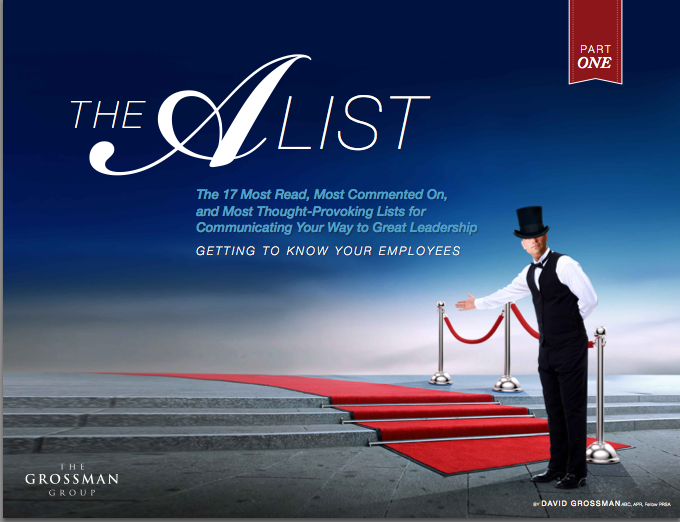 A nod to the value of lists, the new two-part ebook, The A List: The 17 Most Read, Most Commented On, and Most Thought-Provoking Lists for Communicating Your Way to Great Leadership, brings together the best list posts of the leadercommunicator Blog. Part 1, "Getting to Know Your Employees" is filled with a wealth of best practices for connecting directly with employees for an enviably motivated and inspired workforce. Part 2, coming out next month, focuses on big-picture, organization-wide communication. Each and every list is useful and practical, and offers up tips and strategies that can literally be put into practice immediately. All give leadercommunicators a clear path to communicating better to become better, more effective leaders.